As we witness the violent decline of humanity, the courage and faith of the Coptic Christians in Egypt continues to be an inspiration for the Christian world. The Coptic Christians strive to survive and preserve their ancient religious traditions, in spite of their persecution and the violence that surrounds them. A marginalized minority of Coptic Christians, the Zabbaleen (zeballeen) were forced to relocate to the outskirts of Cairo in 1969, when the Governor of Cairo had thousands of rubbish collectors moved to the east of the city, on the lower slopes of the Muqattam Mountain. There are seven Zabbaleen districts where these brave Copts continue their ancient Christian traditions in caves, and survive by collecting trash. 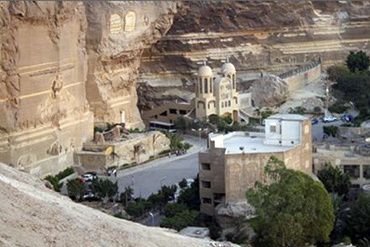 The determination of these Coptic Christians to honor Christ and the Virgin Mary, has led them to erect the largest church in the Middle East, the Monastery of St. Simon. Seven churches and chapels are hidden within a series of caves inside the monastery. Please click on this link to view stunning images of this monastery, as a moving and powerful example of a persecuted people determined to preserve their Christian traditions. While there are differences between Copts and Roman Catholics, it would be disingenuous and unfair to ignore the plight of the Coptic Christians; therefore, this commentary is not a modernist ecumenical dialogue, like the one managed by socialists in the Vatican. This commentary is about Christian courage and survival, against all odds.